Will they determine the presidency in 2016? 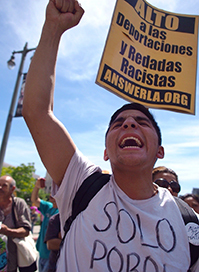 The Latino electorate is expanding rapidly and reshaping American politics. Latinos — the term often is used interchangeably with “Hispanics” — are expected to reach 31 percent of the U.S. population by 2060, up from 17 percent today. As their influence grows, both the Democratic and Republican parties are courting Latino voters. President Obama won 71 percent of the Hispanic vote in 2012, reflecting the Democratic Party's traditional dominance among Latinos, but Republicans have had some success in recent races. Some experts say the potential presidential candidacies of Florida Republicans Marco Rubio, a Cuban-American, and Jeb Bush, a Spanish-speaking supporter of immigration reform who is married to a Latina, could give the GOP an advantage among Latinos. Democrats say their party will again run well with Hispanics, citing the GOP's resistance to immigration reform, climate change legislation and other Democratic proposals. Still, because much of the Latino population is not yet of voting age, experts say Latinos' political influence has yet to reach its full potential.